It’s not very often that I’m really impressed with a shampoo and conditioner as a duo. To be honest, shampoo and conditioner fall in the same category as a body wash / shower gel for me: They get washed down the drain in a matter of minutes. So when I mention these types of products in a blog post, you know they’re good! Suigo… I had never heard of this brand before I was introduced to them a couple of weeks ago. Let me fill you in on a couple of information snippets about the brand: Suigo is a salon hair care brand, developed in Australia, and formulated in Japan. I have been married to Neal for just over 2 years (I have known him for about 7 years now) and ever since I can remember, he has driven Japanese manufactured cars (Honda to be exact). This is what he says about the Japanese (and I quote): “They are perfectionists and pay attention to every detail of their designs, doing everything with purpose, passion and precision.” Because of this, I regard most products that are produced in Japan (not China) as high quality. I mean, sushi originated in Japan. I rest my case. Suigo closely monitor their manufacturing processes to eliminate emissions, minimise waste through recycling and maximise product usefulness because they are committed to the environment. Their philosophy focuses on naturally derived and clinically tested ingredients to enhance the effectiveness of their products. I mentioned to Wendy (the owner of Beauty-Worx) that I am currently battling with super dry hair that has been chemically treated (highlights back in the day, and now hair dye). 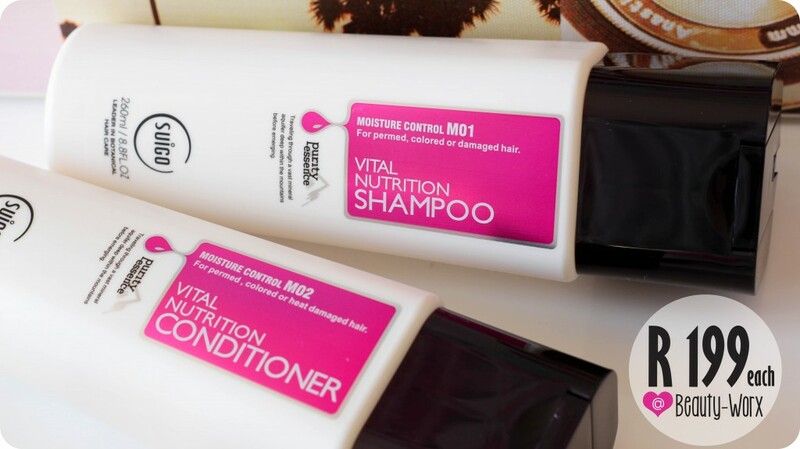 I received the Moisture Control Vital Nutrition range that is designed for permed (do people still perm their hair!? ), coloured or heat damaged hair. What Suigo says: This range is designed to nourish, soften and protect the hair against physical and chemical damage. It is ideal for use after colouring or chemically treating hair, as it closes the cuticles promoting long-lasting colour and shine. Ideal for course, extremely dry hair and excellent for a dry scalp. Ingredients include keratin, orchid extract, organic Brazilian palm oil, avocado and vitamin E.
My review: The shampoo has a light & creamy consistency and yet it cleanses my hair very well but doesn’t leave my hair with that ‘squeaky clean’ feeling, which I like. Since my hair is already so dry, I feel it needs a shampoo that 1. gently cleanses; 2. removes oil and / or product build-up; and 3. nourishes. That’s definitely the case with this shampoo, it creates a thick and creamy lather and after rinsing it out, my hair feels smooth and silky to the touch. I am also loving the scent of this range – it is light and uplifting, a mix between floral and ever so slightly fruity. The conditioner, for me, is the star of the 2 products. It packs a punch like a hair treatment, but is still light on the locks like a daily conditioner should be. I leave it on my hair for about 5 minutes and then rinse it out. Here’s what I love about this conditioner: It rinses out really well and doesn’t leave my hair feeling sticky or weighed down. As mentioned before, it feels like I am applying a treatment to my hair (it is quite rich in texture) and leaves my hair tangle-free and nourished. I like to leave my hair to air dry, and have definitely noticed less frizz and more shine since I have started using these 2 products. The price: The shampoo and conditioner retails R 199,00 each and is available from Beauty-Worx. They offer free delivery on orders over R 500,00 and also stock brands such as Ordinary Skincare (check out this blog post where on of their products made it to my monthly favourites), Konjac Sponges, Tangle Teezer, MUD Makeup, FHI Heat and Moya. The promo: Beauty-Worx currently have a Women’s Day promotion running on their website where you can purchase a Moisture Control Vital Nutrition Shampoo, Moisture Control Vital Nutrition Conditioner plus Moisture Control Vital Nutrition Intensive Hair Repair Treatment for R 549,00 (that’s a saving of R 198,00). The offer ends on Friday (15 August 2014). I think I’m going to purchase the Moisture Control Vital Nutrition Intensive Hair Repair Treatment in the near future, once I have worked through the hair care graveyard that is currently my shower. I’m interested to see what the hair treatment has to offer, especially since the conditioner already feels like a treatment. I love Nicole’s hair style!!! You should do it! We have Suigo in Oz, and the gold range called Volume Control is superb! The conditioner sounds like a winner! When will your next youtube video be up, Luzanne? Can’t wait!! Aaaah no, thinning hair is the WORST! I went through a very difficult phase last year and lost quite a lot of hair – I sincerely hope it gets better for you, Tanusta. 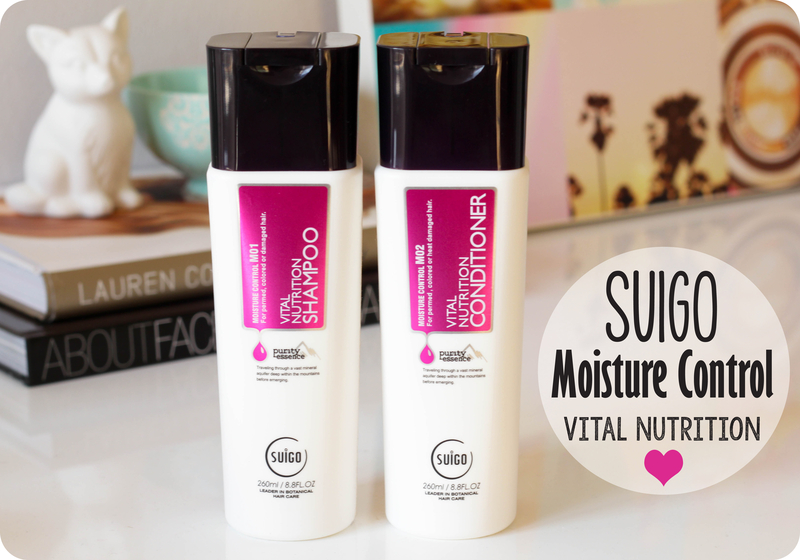 I love the volume control range from Suigo and I agree that the conditioner is excellent without leaving the hair feeling heavy. I am getting more and more compliments about my hair since using Suigo. Thank you for such a beautiful review Luzanne. Love the vibrant pink label! After trying SUIGO shampoo… I LOVE IT !!! I love the texture and smell it makes my hair feeling soft and smooth and will continue using it. Yay! The texture of the 2 products are different to other shampoo and conditioners, hey? I used them again last night and love how creamy they are!! Such a great post, thank you for taking the time to do a review on this Luzanne. I have been thinking about getting some Suigo products but wasn’t sure which to get or if they were really good… Now I know! 🙂 And thank you for introducing me to Beauty Workx, going to check out their website now.